Frustrated with your progress on guitar? Wish you could discover you learn and how this insight could change how you develop in the future? In Fast Forward Your Guitar Playing eBook, you will discover how to build a solid foundation and discover your learning style. So that you can accelerate your guitar playing. Learning guitar can be tough. It's easy to get stuck in rut and give up. Plus it's easy to push yourself to learn faster than you can manage. However, there are is a way to ensure that you progress at a steady speed and avoid most ruts. In Fast Forward Your Guitar Playing eBook, you will learn how to get the basics in order and build a solid foundation. Once you have a firm base, we will cover learning styles. 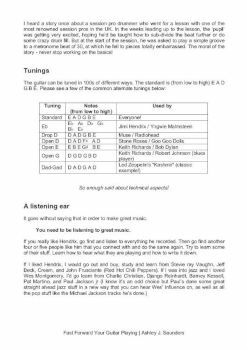 If you understand how you learn, then you can start to advance your guitar playing quickly. 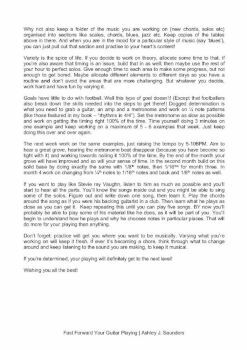 You will then learn how to build your own playing style and how to easily remember your ideas. 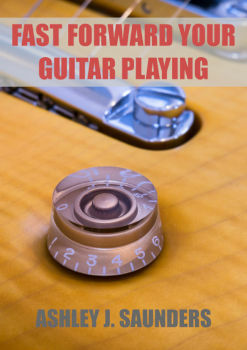 While this eBook is aimed at the more advanced guitarist, there's nothing stopping beginners from reading it and getting ahead from the start! 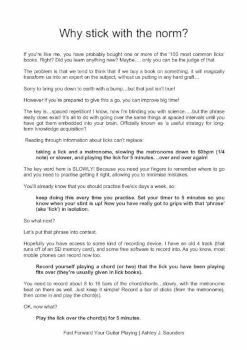 If you're unsure how you learn and how to use this insight to skyrocket your guitar, then you should read this eBook!